It’s the most addicting method according my clients and readers. It’s the density method, in which you do a lot of volume in a little bit of time, therefore burning tons of calories. And now, you can use this NEW and addicting approach using ZERO Equipment. 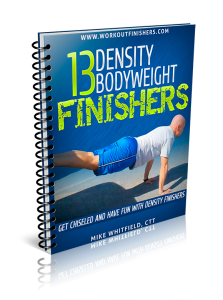 That’s what you’ll get with the new Bodyweight Density Finishers. You’ll also discover the “8 is Enough” finisher I filmed at Brian’s gym in Lapeer, Michigan that really did me in… and it will zap fat in its tracks. You won’t be bored with your workouts using these grand finales. These are also the perfect “extra credit” workouts to burn more fat in less time – even when you travel. P.S. There is NO RISK at all for you to try this Metabolic Finisher program. 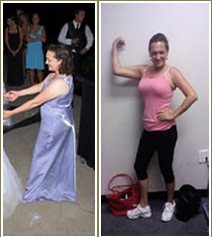 If you are not thrilled with Bodyweight Density Finishers in 60 days, let us know and we’ll refund every penny. Your satisfaction is 100% guaranteed. My workout programs have already been seen on Men’s Health, Turbulence Training and used by thousands of men and women, and I guarantee it will work for you, too.